I was intently listening to the Resource Speaker when my classmate told me that we should get a Master’s Degree. The person on the podium that time was a successful professor from Philippine Normal University. Her every word was full of wisdom and inspiration for graduating students like us. “Yes, and after that, we are going to work in a public school” my classmate responded. “Then, when we already have enough money, let us enroll for a Master’s Degree,” I told her with an affirmation that we really must enroll. After a year teaching in a private school, I decided to contact a friend of mine. She graduated in Philippine Normal University. I know she would be of great help for me. It was on the 23rd of April when I, together with my friend Meliza, went to Manila to make an inquiry in Philippine Normal University. A sense of excitement gushes forth within me by merely seeing the old university from the window of the train. It always feels good that once again, I would be a student in a university. We took off at UN Avenue Station and crossed to the other side of Taft Avenue. We walked towards Save More Supermart and passed the university belt. Philippine Normal University (PNU) was just beside Technological University of the Philippines (TUP). The building’s facade was painted subdued yellow. The digits 1901 was painted near the top of the building, indicating the year it was established. There were a few people inside the university. We saw different images of PNU taken from different angles enclosed in a glass case. There was also a large monitor which showed prominent people who had made significant contributions to the university. On its right side was a corridor that led to the different offices. On the other side was a stairway used to go to the upper floor. We walked in the direction of the Admission Office. In front of it are bulletin boards which display information for both graduate and undergraduate students. We asked the staff inside the Admission Office about the requirements needed to submit for a Master Degree. After a week, we went there again to submit our requirements and to undergo an interview. One of the requirements to be admitted to the university is to pass the GCAT. So, what is GCAT? It stands for Graduate College Admission Test. I took the exam on May 15, 2010. Meliza and I agreed to meet at the train station at exactly 7 in the morning that day. We arrived at the university at 7:45 and that time I already felt butterflies in my stomach. Since Philippine Normal University was my friend’s Alma Mater, we did not find any difficulties in looking for the assigned room. It was on the second floor of the building. Finally, we were at the doorstep of Room 206. There were still few vacant seats. The proctor instructed us to check for our name first on the door. Our names were there so we proceeded inside the classroom. We prepared Mongol no. 2 pencil and our examination permit . The proctor checked all the examination permits and gave us the test questionnaire. It was composed of general and cloze test in English and in Filipino, reading comprehension, math and logic test. I taught history and I was able to answer questions on general category easily. I still remember my answers there such as the Ikebana and other tourist attractions on different countries. It took me a long time to answer the cloze and reading comprehension test. When it was Math and the logic part already, I felt so nervous that I whispered a silent prayer that God may guide me in answering those. I did not pass the test right away after I finished it, instead, I used the remaining time to review my answers. I checked all the items to make sure I did not skip any number. That has been always my technique in taking an exam. If I cannot figure out what is the correct answer, I just make a wise guess. It was exact 11 AM when I passed my test paper. When I went out of the room, Meliza and I chatted about our answers on the test. I kept on asking her about some items in Math such as how many weeks are there in 3 years and some questions in linear equations. Math is really my waterloo. I don’t know why but numbers really do make me dizzy. After that, my friend and I agreed to go to Quiapo church to pray. That day went fine to both of us. May 22nd was the date when we found out the result of our GCAT examination. The proctor who had been there with us while taking the GCAT gave us the telephone number and the website of PNU if we could not go to the university to check the result. I grimaced slightly in disgust when I thought about the information he gave us. The PNU website was not always updated and it was a bit difficult to contact them through a phone. I did try all those things when I was inquiring for a Graduate Degree but it was futile. I thought that the best way was to visit the university. Since my younger sister will be going to PNU on that date, I just asked her to check the result. She left home early in the morning because she had to buy some stuff to Divisoria. After that, she went to PNU to check the result and also do some school activities there. She arrived 8:00pm and I was doing my online job that time. I heard her hurried footsteps from the living room. She was beaming with happiness when she told me that I made it, I passed my GCAT exam. I was overjoyed and speechless. My worries about the result had gone. My parents soon forgot their anxieties and were also elated to the good news. I enrolled there May 28th and that was the start of my MA life. © 2016 – 2019, Roads and Pages. All rights reserved. Ana Rose was born and raised in the Philippines. A simple Filipina who was born with a natural love for books and languages. Hi, I am asking for a friend. Do you happen to know when’s the next GCAT sched? Thanks! Pwede po kayong kumuha ng Masteral degree kahit wala kang teaching experience sa school? Ang job ko kasi e, onling teaching. Yes po, its possible. I had classmate before who was doing online teaching as well when we were doing our Masters degree. hi mam thank you po sa blog ninyo it helped a lot to pursue my MA degree. by the way question lang po H.S public teacher po ako major in TECH VOC. but gusto kong kunin sa course sa MA is history teaching. kasi gusto ko ituro ang history. papayagan po ba ako ng university aun ang kunin ko? salamat po sa sagot mam. I think there is a need na kumuha ka po ng units sa undergrad nyo po para ma-align po sya. 🙂 Good luck po! Good day, Ma’am! Ask ko lang po sana if dapat po bang may atleats 2 years of teaching experience bago po pwedeng kumuha ng master’s degree sa PNU? Maraming Salamat po. Hi Farah, I am very sorry for late response. 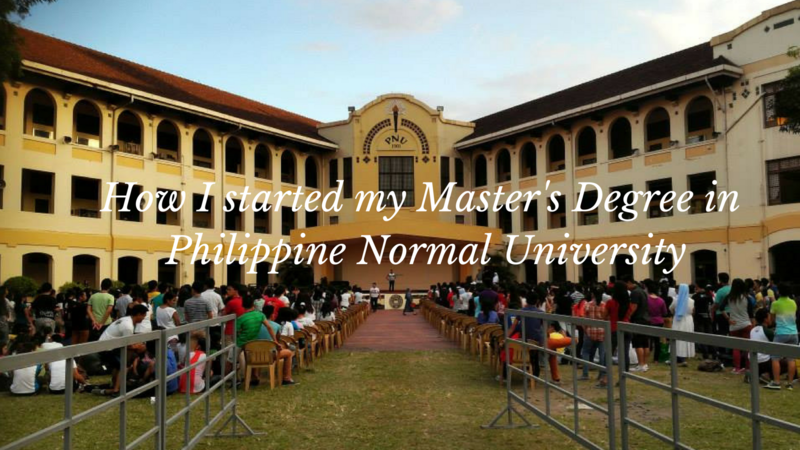 I only have one year teaching experience when I enrolled in the Philippine Normal University. Hi Julie! As far as I know we were the last batch who graduated in the non thesis program. But to be sure, you may inquire to them personally if they are giving exceptions. Hi! I’m planning to have my MA at PNU and I still have a few weeks to review for the exam (because this was a spur of the moment decision). Is it okay if you share a bit of the exam coverage? I’m not sure where to start reviewing. I am really /really/ bad at Math! I took up Comm. Arts because I thought there wouldn’t be Math. 🙁 was the Math part hard? im sorry. im really nervous about the exam. Thanks for visiting our blog. All that I remember about the GCAT Exam I took last 2010 were written in here. It is already 2018 and I am not sure if the coverage of the GCAT for this year is still the same as the GCAT Exam I took 8 years ago. I hope you will be able to pass your GCAT with flying colors. Hi! I am actually interested in pursuing my MA in PNU. I am working from Monday to Friday. So Saturday is the only day I can allot for my MA. I’m worried about the schedule, may I ask how the class schedule is? And also how long will it take finish the MA? When I started with my Masters Degree, I was also working in a school. So I was a teacher from Monday to Friday, and a student every Saturday. It was difficult. Anyway, it was expected already once we enroll in a Graduate Class. But those hardships were nothing compared to what will we get after we finished it. Thank you for answering. Now my only concern is the additional undergraduate units. I’m actually a Psychology graduate who plans to take MAEd in Guidance and Counseling. Since it is MAEd, I assume they are going to require you to take undergrad teaching units before/during your MA as a prerequisite in some subjects. Have you ever encounter this or know someone with the same problem? Oh, nope, I did not encounter that. I graduated with MAT in PNU. When I enrolled in PNU for my Masters, I was not yet in the field. I was just waiting for a call from the school where I applied. Hi anna rose, I just want to ask poiters to review or even tips on their exam. hope you givr me to start my review thank you and bless. Hi. Thanks Ana for sharing your experiences you had during your application for graduate school. I felt your excitement when you knew you’ve passed the GCAT exam. Can you also share your experiences and tips how you finished the program? I am now currently studying my MA in Early Childhood program in PNU as well. Thank you. Hello ma’am,I just want to ask if you have an idea if pnu will offer Masters in Early Childhood this summer?I’m planning to enrol but only this summer.Hoping for your response.God bless! Congratulations! So, I came across your site while looking for blogs about “PNU Masteral courses” and I found it very helpful! Thanks! I am considering to have my Masters in PNU too because it is the only university (except UP) that offers the course that I want. Could you share some tips on taking the GCAT? It has been two years since I graduated and I am not that confident on taking entrance tests again especially Math too! 🙂 Thanks! Anyways, I wish you all the best on your Masteral journey! Sorry, I mean PWU. 🙂 I got confused between the two because I am choosing among them. Geez! What is happening to me?! Hahaha. I said it correctly the first time. I cannot delete or edit my comment so here I am apologizing again. 🙂 Thank you again! Always aiming to improve ourselves is one goal we should never put aside. The gift of education is really important. I, too, took master’s degree but sadly when I got pregnant, I wasnt able to continue. It has been one of my regrets. I always believe in the quality of education at Philippine Normal University and the graduates it produces. I often find the students there too passionate. I have seen them grow and spread their wings outside the classroom. They truly love teaching. They find it as their vocation. I also see that passion in you. Congratulations! I can almost imagine how you must have felt when you found out that you passed the GCAT. I was also extremely happy when I found out I passed the entrance exam for MBA-Regis at the APS. Unfortunately, due to unavoidable circumstances I was not able to finish my Masters. I wish you all the best so you can finish your Master’s Degree. I heard it’s really important especially for those in the academe. Cheers! Congratulations! Higher education always helps particularly if you are in teaching field. All the best for future! Congratulations! This is a great step in life and you should be proud of this achievement, While it might be a stressful time it will all be worth it in the end. I wish you all the best and plenty of success. Congrats on your MA, have you completed it? I just attended the Education summit last Nov 3-4, and I found out that public schools are receiving better pay than their private counterparts (unless top tier school). Good luck in your career! It is my understanding that the term top tier school when it comes to salary for teachers is BS. For instance, my kids attend Xavier School. The teachers there swear that most of them receive entry level salaries as opposed to public schools. It sort of burst my belief that top schools with expensive tuition can pay higher wages, better than average that is. For most teachers, and I think Ana Rose can confirm this, wages in public schools are better, but for one to get into public schools, sometimes (or more often) one needs a padrino. When it comes to salary, a public school teacher earns a bigger amount compared to those who are teaching in private institution. I am just not sure of those teachers in top tier schools. Aside from that, public school teachers also have its monthly allowance and receive a lot of benefits as well. If top tier schools treat their teachers that way, they will soon lose them to public schools. But a friend in public school says “mataas nga sweldo, dami naman trabaho. matagal bago mag increase at malabo din career growth”.